I swapped out the banjo wheel (which I still have) to a smaller wood wheel like a lot of people do. I'm not as svelte as I once was. The larger wheel also caused some throttle control issues. I gained some more clearance by mounting he seats directly to the floor. You appear to have some cross members running under the seats. is that raising your seats up? Yep. I wanted mine on steel with nothing protruding through the floor and so here we are. The good news is you can always just cut them out if need be, or eliminate the slider in favor of a couple 3/16 bits of flat stock, which would gain about 3/4 or an inch. As is, I fit OK; still had a notch of adjustment to move back when I left it last night. Tonight I adjusted the pedals back today and drilled my steel frame bits to move the seat about 1/2 inch to the right (it was just barely rubbing the frame tube after the reupholstery job). I'll test fit again before final assembly but for now I think it's gonna be alright. Making this rather larger cable shifter box fit in the Spyder and look sort of like it's supposed to = many hours. Update on my build. Not much going on but I'm still progressing. Block sanding the car now. I used one. Since it leaves you with only one pack of torsion leaves, I replaced a couple of stock leaves with Sway Away heavy duty leaves to restore front spring capacity. For everyone's info Formula FST racers are formula Vee but allow the ball joint front end. Info for those interested in Zero roll rear suspension & etc. Thanks, Ralph. I'm going to do something with a separate bar. Not sure just how yet. Meanwhile, I took a break from blocking the car out this weekend to make some 550-style clam latches. Nice work Ed, I like the latches. Now to get this dang thing painted! Still working on getting a painter. One guy looked at it and was encouraging and then flaked off. I talked to another guy yesterday. While waiting for those guys I decided to make a Spyderesque cover for the gas tank. It's coming along rather well. 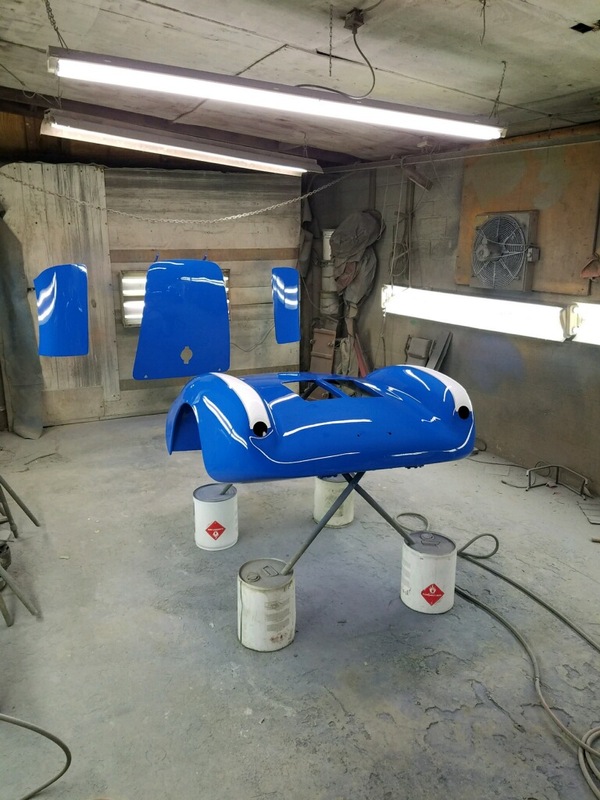 The car is now with the painter. He says 2-3 weeks. Fingers crossed. Paint is going on the car. It's happening, men. This is not a drill. Looks nice! I like the color. I have always liked Seinfeld's spyder and almost went that direction on mine. I stayed with white and regret it a little. What interior color are you doing? It's the sand/tan and red barberpole vinyl. Here's a shot of the seats. I have enough material to do the interior properly as original, and will see to that as soon as the engine is in and the switches and levers are all sorted.